This is an actual POW MIA Medallion. It has been hand painted and fired in a kiln. The coin is then set on a belt buckle. The belt buckle displays POW MIA (Prisoners of War/Missing In Action) insignia designed by Newt Heisley. a fighter pilot during World War II. The insignia is black, bearing in the center, in black and white, the emblem of the League. The emblem is a white disk bearing in black silhouette the bust of a man, watch tower with a guard holding a rifle, and a strand of barbed wire; above the disk are the white letters POW and MIA framing a white 5-pointed star; below the disk is a black and white wreath above the white motto YOU ARE NOT FORGOTTEN. The POW/MIA insignia calls to mind the sacrifice and plight of those Americans who have sacrificed their own freedom, to preserve liberty for all of us. This beautiful hand-painted medallion continues a very old art form of a family of artists. In painstaking fashion, the artist applies color initially to outline the design, followed by high tempered firing process. The firing process is repeated after each color is applied. The hand-painting process for each piece varies, some taking as long as two days to complete. In the final stage, in order to protect the delicate hand painting, the artist applies and bakes-on a covering of space age plastic, which also adds depth and luster to the item while providing protection forever. 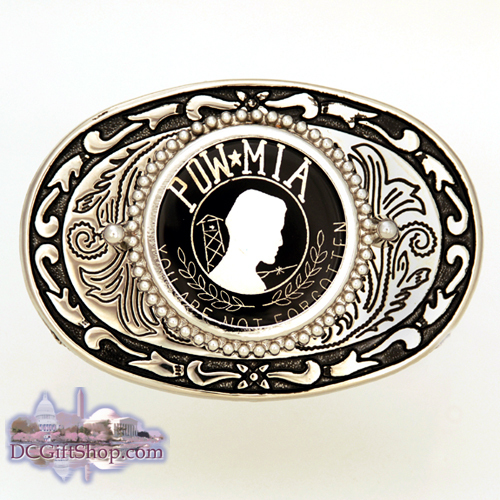 POW MIA Medallion belt buckle is a wonderful and practical item for yourself to use or as a cherishable for that special Veteran! Please allow three weeks from the time of order for our artist to complete your one-of-a-kind belt buckle.